Let Simpsound put our decades of experience and award-winning designs to work for you, making your next special event an occasion to remember by all. With tens of thousands of songs in our library and knowledge of a variety of formats, our playlists are customized to your musical tastes and for your event. We encourage your suggestions! Whether it's a small social function or a large wedding reception, Simpsound can create make your next event simply magical. Contact us today for a custom quote. Check out our Photo Gallery to see how we have used lighting to turn the average venue into something spectacular. Let Simpsound do this for your next event! View our Photo Gallery to see our work! 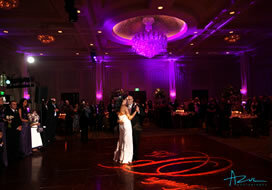 Looking for a professional DJ or lighting for your wedding reception or corporate event? At Simpsound, we focus on what YOU want. It's all about matching our styles and personality to make your event successful. We thrive on our reputation as being a company that delivers an impeccable combination of professionalism, great music, amazing sound and lighting, and the personal details which add up to fun for you and your guests. Jeff Simpson has 30 years DJ experience, performing and lighting thousands of wedding receptions, proms and corporate events throughout the Triangle – Raleigh, Durham, Cary, Apex – and the Southeast. Contact Jeff today for your fully customized quote, for more information about our services and to schedule a complimentary consultation. Music can create the right mood, but when it's played matters. Lighting takes the atmosphere to a different planet. ©2015 Simpsound. Website by TyvolaWebMedia.